Sider-Kapisi — the Byzantine Siderokávsia  and in Turkish times the greatest metallurgical centre in Macedonia — attracted a stream of workers from far and wide. In addition to the Greek labourers living there, there were technicians of an astonishing variety of races — Bulgarians, Serbs, Turks, Albanians, Jews and even Germans. 4. On Siderokávsia at the end of the Byzantine era, see Ostrogorskij, The Serbian state of Sérres, pp. 69 ff. 5. See the folk-song connected with Isvoros in St. Papastavrou, Ἔθιμα καὶ παραδόσεις τῆς Χαλκιδικῆς, «Χρονικὰ Χαλκιδικῆς» 4 (1962) 179. 6. J. Ph. Fallmerayer points out (Schriften und Tagebücher, Munich - Leipzig 1913, vol. 2, p. 155, note 1) A. Grisebach's mistake in his Reise durch Rumelien und nach Brussa im Jahre 1839, Göttingen 1841, vol. 2, pp. 13-14, while Grisebach locates Siderokávsia correctly. On Mademochoria and Hasikoçhoria, see pp. 12-13.
the two lowest of five craggy hills . The present Madém Lákkos (see fig. 51) must also have been an important and old-established mining centre in those days. agricultural produce; but they would not have to pay the 10% for the army or the tax on casks (fıçılar) or any transport dues levied on their horses. They were to devote a tithe of their vineyards to making wine-must, and were not to prevent any, who wanted to, from making charcoal . From 1530 onwards — that is to say, after Suleyman I (1520-1566) had reorganized the mines — Siderokávsia enjoyed a new peak of prosperity with its production of both silver and gold. The settlement grew at a rapid rate. Around the middle of the 16th century, the once shabby village had developed into a respectably-sized town, and it reminded Belon of Joachimstal in Bohemia. When the folk of the surrounding villages came down to Siderokávsia to sell their produce, Greek and Serb could be heard in the market-place. However, Spanish-Hebrew was the normal language of the town, having been imposed by the large numbers of Jews that had converged upon the important mining centre. Indeed, so large was the Jewish element that the working week finished on Friday, and the workers in the mines were off-work both Saturday and Sunday (one wonders whether they were paid for the two rest days). The Sultan collected on average from 18 to 30 thousand ducats' worth of ore a month. The silver and gold was not found in a pure state and was refined in the five or six hundred furnaces that were scattered over the mountains and worked by more than 6.000 Albanians, Greeks, Jews, Vlachs, Circassians, Serbs, and Turks. 1. See Fr. Babinger, Sultanische Urkunden zur Geschichte der osmanischen Wirtschaft, etc., Munich 1956, pp. 232-237. See also the same subject in N. Beldiceanu, Les actes des premiers sultans, etc., Paris 1960, vol. 1, p. 138. See other ordinances connected with Siderokávsia during the same period in N. Beldiceanu, Les actes des premiers sultans, etc., Réglements miniers (1390-1512), Paris 1964, vol. 2, pp. 183-187.
and from them the inhabitants had picked up the German names of the metals and the metallurgical tools. Near Siderokávsia were the villagers of Piavić and Serine, which were near the sea . The former seems to have been some sort of encampment for Serbian miners . The mines were working during the next few decades, but the yield appears to have been diminishing gradually . 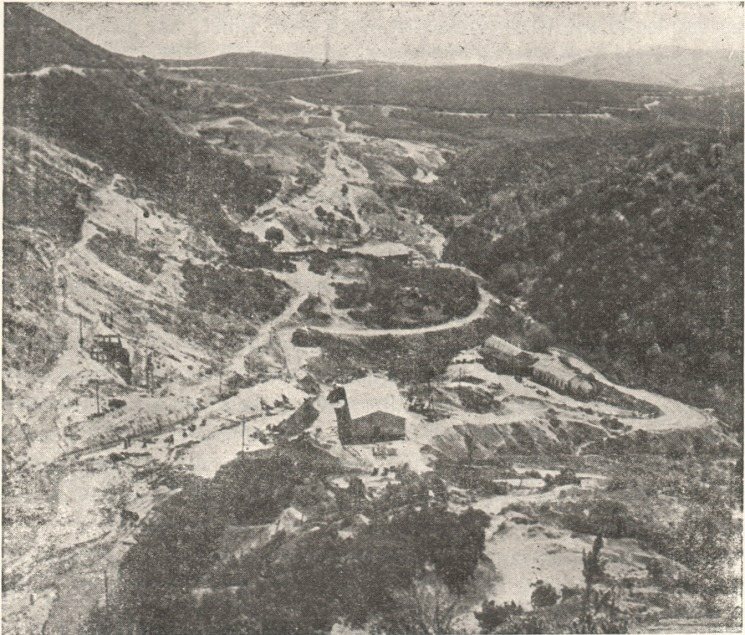 There seems to have been some relation between the fortunes of the mining centre and the ten day trade-fair that took place at Pazaroúda (Pazargâh) — a small town belonging to the nahiye (sub-district) of Siderokávsia and situated near the hot springs of Lake Volvi (Besikia): that is to say, the trade-fair coincided with the acme of the locality's prosperity. Later on, during the reign of Selim I (1566-1574), the face of Pazaroúda changed some-what, when more building took place and Moslems exempt from taxes took up residence there . By the end of the 16th century, work in the mines had greatly diminished, if indeed it had not ceased altogether. This can be concluded from a firman issued in 1580 to the newly-appointed Kadı of Siderokávsia, in which it is declared that, while he had been given instructions to put more energy into the mines and to dispatch ample supplies of coin to Constantinople before New Year's Day, the time had gone by and the New Year was approaching without the central authorities' having received any information on the subject . 1. 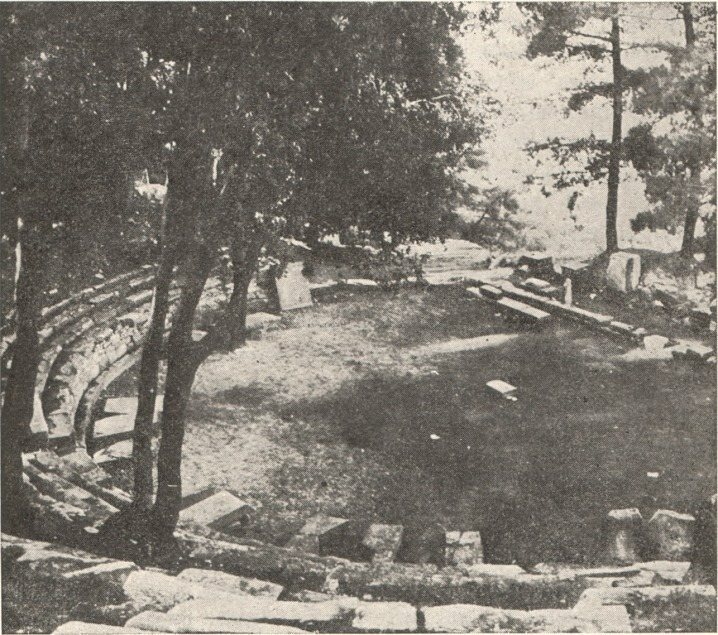 Vacalopoulos, Ἱστορία, vol. 2, pp. 366-367, where the relevant bibliography may be found. In addition to this, see the interesting details in R. Lubenau, Sahm, Beschreibung, part 1, p. 112. 2. Basing himself on this information of Belon that the majority of the metallurgical workers were Bulgarian, a writer for the Bulgarian Academy of Sciences has come to the conclusion that «it was the Bulgarian national element which was predominant on the Belomore (Aegean)»! See P. Koledarov, The ethnological composition of the Dráma region up to the middle of the XIX century (in Bulgarian), «Izvestija na Instituta za Istorija» 10 (1962) 186. 3. R. Anhegger, Beiträge zur Geschichte des Bergbaus im Osmanischen Reich, I. Europäische Türkei, Istanbul 1943, vol. 1, pp. 182-183. 4. See Moschopoulos, Ἡ Ἑλλὰς κατὰ τὸν Ἐβλιὰ Τσελεμπῆ, ΕΕΒΣ 14 (1938) 497-498. 5. Moschopoulos, ibid., pp. 496-497. 6. See Ahmed Refik, Turkiye Madenleri, Istanbul 1931, p. 19, document no. 32. See also Anhegger, ibid, vol. 1, p. 182; vol. 2, p. 307. On the silver coinage (akçes) of Siderokávsia, see Anhegger, ibid., vol. 1, p. 183. See, besides, Ioan. Leunclavius, Annales Sultanorum Othmanidorum, Francofurdi 1588, pp. 221 ff. In contrast with the Christian migrants of Macedonia (if not of the Balkans generally) the Turks were still permanently established in those districts where they had been settled after the original Turkish conquests; and this was particularly so in the case of the Yürüks. In 1543 we find them divided up into the following ortas (military companies): at Monastir into 7, Prilep 13, Flórina 36, Sérvia 33, Kalamariá 35, Purnar Daği (between Kavála and Orfanó) 8, Yenice Vardar 2, Avret Hisar (the district of Kilkís) 47, Stromnica 28, Demir Hisar 8 . The influx of neighbouring peoples from the north into the Greek lands is a most interesting phenomenon. Once the boundary - walls of the medieval nation - based states had fallen and the Balkan Peninsula had become a unified Turkish possession, there was completed freedom of movement for the various Balkan peoples, particularly the Christians. Α large number of Greeks travelled northwards to stop temporarily or settle permanently in the ancient Greek towns and cities of Bulgaria, reinforcing the indigenous Greek population (or even forming settlements in new villages). Some went still further north to the trans-Danubian provinces, where they invigorated the small nuclei of Greek settlements dating from the last years of Byzantium, or founded new ones; others, again, made for what is to-day Yugoslavia. However, at the time when all this was happening, a comparable stream of peoples was flowing in the opposite direction, with the northern Greek lands as their goal; and this influx was made up principally of Bulgarians. 1. Gökbilgin, Rumeli᾽de Yürükler, pp. 75-76. 2. P. Koledarov, The ethnic composition of the Drama region (in Bulgarian), «Izvestija na Instituta za Istorija» 10 (1962) 176-177.
the Belomore (Aegean). They went 'abroad' to the districts of Sérres and Dráma as seasonal workers, fishermen, artisans, blacksmiths, etc. Α good many left the valleys on the upper reaches of the Struma (Strymon) and Mesta (Nestus) for the productive cotton regions of the plains. Thus for example, in the autumn labourers would make their way, either alone or with their families, from Kresna to the villages and factories around Zíchna, to work at cleaning cotton; while the menfolk of Bansko used to go as işçiliks, i.e. labourers. From Krúševo came shoe-makers and haberdashers, from Nevrokop gardeners, potters and brick-makers, from Akhechelebyisk sellers of tweed-cloth, from Razlok purveyors and merchants in cotton. Α considerable number of peasants from Gorna-Djumaya went down to the Dráma and Sérres districts for work. We have information that people from Kastoriá too found work as gardeners and millers in the districts of Dráma, Xánthi and Komotiní. Here it must be pointed out that after their wintering on the Aegean, not all the herdsmen and labourers returned once more to the mountains: a considerable number remained in the plains to work as agricultural labourers or as artisans" . At this point Koledarov propounds the following chauvinistic absurdity: "The supremacy of the Bulgarian element was maintained by virtue of the fact that it inhabited the territories from of old, and by reason of the strength of the laws of cultural geography"  (!) According to his views, the Greeks of the Dráma district ranked as the third ethnic element, numerically speaking, after the Bulgarians and Turks; the Greek element disappeared almost completely as time went on, and its re-appearance and increase in the second half of the 19th century is due to 'external factors'! . 1. Koledarov, The ethnological composition of the Drama region (in Bulgarian), «Izvestija na Instituta za Istorija» 10 (1962) 179-180. 2. Koledarov, ibid., p. 181.
make reply myself, I shall quote from Ὁἱ Σαρακατσάνοι' of Angeliki Hatzimichales, which is undoubtedly the best study that has been made of the Sarakatsan life. Fig. 52. Sarakatsan woman from Arnaia. Peninsula. In other words, the Sarakatsan migrations covered the whole area over which the Greek language had spread up to the end of the Turkish occupation. Skopje and Sofia). Below this northern line the Sarakatsans spread all over the Peninsula: to the south as far as the Adriatic, the Ioanian and the Aegean Seas. They inundated the whole of the Rhodope Mountains (see fig. 53), the plains around Philippopolis and Adrianople, and poured out into the whole of Eastern Rumelia. They also passed north of the Balkan Range into all the lowland pastures of the Black Sea Coast. Skirting the Sea of Marmara, they continued into Asia Minor and even reached as far as Cappadocia. Fig. 53. 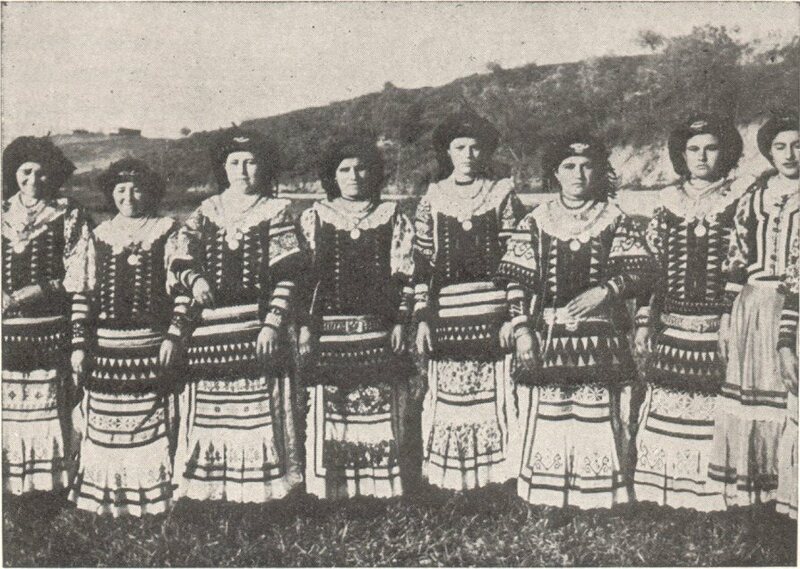 Sarakatsan women from the region of Xánthi and Komotini. Seas, or towards Thrace and Macedonia — filling the plains of the whole of Sterea Hellas and reaching Attica, Euboea and the northern Peloponnese. The shepherd migrations of the Balkan Peninsula were of great significance up to the end of the 19th century, for the nomades were able to move freely under the undivided rule of the Turks. Yet even after the formation of the individual nation states of the Balkans (Serbia, Greece, Rumania, Bulgaria and Albania), the Sarakatsans continued to move about freely until the end of the 19th century and the beginning of the 20th; for the governments of the period put no obstacles in the way of nomadic peoples as they migrated across the frontiers" . 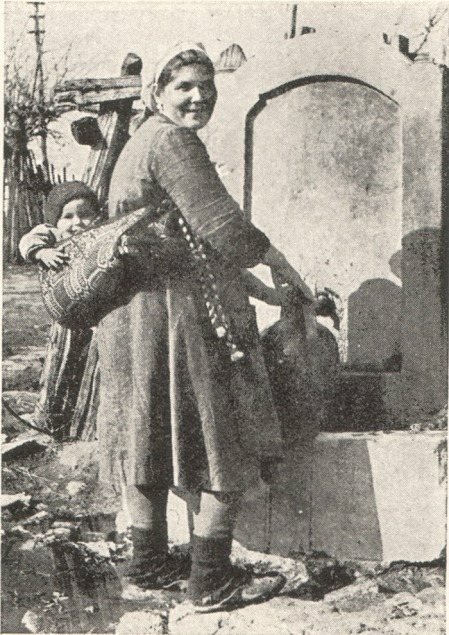 Returning to the southward movement of Bulgarian seasonal labourers, even as late as the beginning of the 20th century inhabitants of Chalcidice hired labourers from Bulgaria and the Slav-speaking mountain regions of Macedonia for charcoal burning and various agricultural jobs. As we observed earlier, there were many who married and returned no more to their native lands . This regular migration of Bulgarians into Macedonia resulted in a fresh reinforcement of what was left of the old Slav settlements. (A similar phenomenon was observed in the Cyclades, where western European pirates and merchants reinforced the old Frankish element). In other words, throughout the period of Turkish occupation we have a new and unimpeded influx of Slavs, principally Bulgars (though peaceful on this occasion), into the lands of northern Greece. This influx did not, however, assume the proportions of the older immigration of Slavs, though it served to re-inforce the prevailing linguistic groupings and revitalise the remnants of former Slav settlements; and a number of new settlements were formed too. The Bulgarian peasants or labourers of Turkish times played their part, as one might expect, in introducing new Slav place-names. Typical examples are the name of the village of Novo Selo (New village) in north-east Chalcidice, and the Slav place-names in the surrounding area, which are mentioned in a document of 1640 , and actually exceed the number of Greek place-names. 1. Ang. Hatzimichali, Σαρακατσάνοι, Athens 1957, vol. 1, pp. xxvii-xxix, where the relevant bibliography may be found. 2. See Oeconomos, Πῶς Ἕλληνες ἐπιχειρηματίαι ἐμίσθωνον ὡς ἀνθρακεῖς σλαυοϕώνους εἰς τὴν Χαλκιδικήν, «Χρον. Χαλκιδικῆς» 2 (1961) 193-194. 3. Kyriakides, Θεσσαλονικιά μελετήματα, pp. 11, 13, 17. Map 5. Mount Athos and Thasos. and other historians have been unaware of this fresh infiltration of Slavs into Northern Greek lands; and they have in consequence been responsible for a good number of inaccuracies in their evaluation of the results of the older series of Slav incursions. 1. Bakalopoulos, Thasos, p. 59.
ρων ) is to be located near the Greek villages of Rachóni and Áyios Geórgios, and came eventually to be applied to the combined community of the two villages. Ignorant of this historical fact, Vasmer was unable to explain the origin of the place-name or put a date to it . With regard to Thasos during the Turkish period, the oldest historical evidence that we know of goes back to the 15th century (see map 5). In January 1478 (i.e. towards the end of the Veneto-Turkish war of 1463-1479), the Venetian captain Scipio Buono inflicted damage on some Turkish and Greek merchant ships as they lay in the harbour of Thasos . 'Thiaso' is found marked with its castle on the portolans of the following century . At the beginning of the 16th century, Thasos, we hear, is thickly inhabited, rich, and possessing two more strong and handsome castles . Around the middle of the century Belon visited the island and spent three days exploring it. He speaks admiringly of its antiquities (see fig. 54), the remains of its ancient harbour, its marbles, and of the island's forests, which were full of firs and pines. He also noticed in some areas great heaps of slag, which had accumulated from mining operations in ancient times; and he adds the fact that in his own day the mines were no longer being worked . 1. See Bakalopoulos, Thasos, p. 59. The same place-name is found at Haloni in the Marmara region and is similarly derived from Bulgarian colonists (Vacalopoulos, Ἱστορία, 2, pp. 372-373), and likewise the other example at Kisamo in Crete, which derives, from Bulgarian slaves (see also N. Tomodakis, Σλάβοι ἐν Κρήτῃ, ΕΕΚΣ 1 (1938) 425. 2. See Μ. Vasmer,Dıe Slaven in Griechenland, Berlin 1941, p. 229. See also pp. 320-321. 3. Sp. Lampros, Δύο ἑλληνικὰ ἔγγραϕα ἐκ τῶν ἀρχείων τῆς Βενετίας, ΝΕ 5 (1908) 479-481. 4. Α. Delatte, Les Portulans Grecs, Liège - Paris 1947, pp. 227, 306. 5. Benedetto Bordone, Isolario ricoretto et nuovo ristampato, etc., Venice, 1572, sheet LIX second page. 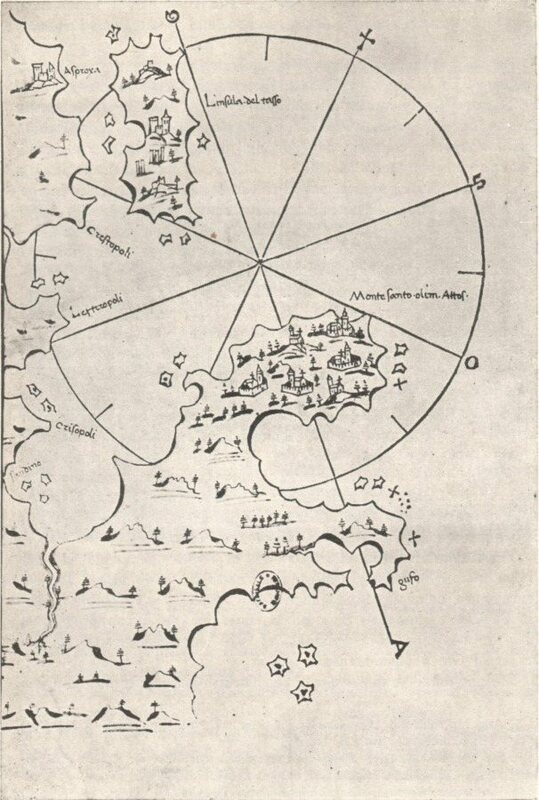 See also Thomaso Porcacchi, L'isole più famose del mondo, Venice 1572, p. 34: «...et Tasso, isola presso Monte Santo, che gira quaranta miglia; la quale è molto habitata et ha tre belle terre, et assai è abbondante», where 'terra' = city. See the word in the dictionary of Somavera: terra, borgo = ἡ χώρα. 6. Belon, Observations, ch. 34, sheet 59-60.